I love the eagle catcher product. 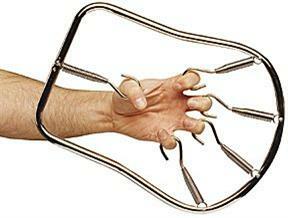 The only really bad thing about this product is that the springs can hurt your fingers. I do two different workouts. 3 sets x 10 of Grabbing, 3 sets x 10 of Pinching. This ultimately works your wrists. fingers, and forearms. I like the way it works your hands, but the only problem is that my hands are almost too small for it. I wish these things had different sizes for smaller hands. Email your friend about the Eagle Catcher. Ask a question about the Eagle Catcher.